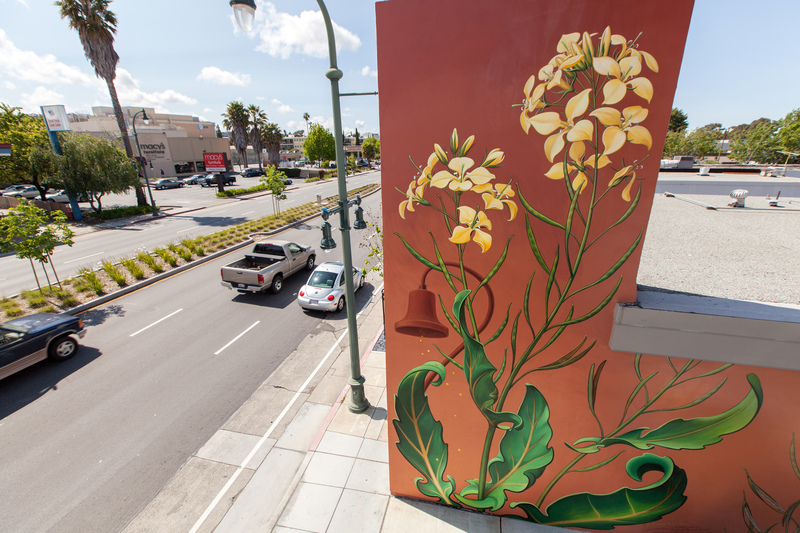 This 120 foot long mural uses the mustard color and the mustard plant (an invasive species in California) as a metaphor to describe the path of El Camino Real, the commissioned subject of the artwork. The mural features a red-colored map of indigenous people’s language groups, with the mission trail crossing over them with a gold-colored physically scored line. The mustard flower is a common weed that has become ubiquitous in agricultural California, and is believed to have been introduced by the first Europeans traveling along El Camino Real, the mission trail. Legend has it that the missionaries purposely spread mustard seeds along the way to mark the path in "royal gold". So in this mural, gold nugget-like mustard seeds drop from the mission bell, scatter, and land on the 50 foot long map to its right, starting the invasion. The first seed lands in Loreto, the starting point of El Camino Real in the South of Baja California. The mission trail starts there and is marked as a golden mustard -colored line, etched into the painting with a knife. This etched line meanders along a giant map of the Californias oriented sideways, with North to the right, across the fading names, in red, of the many indigenous peoples groups along the way. It stops at the northernmost mission, in Solano, California. 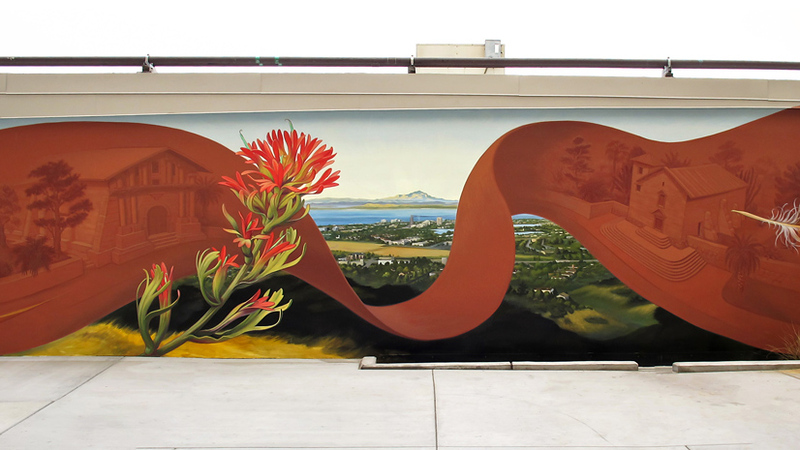 About 80 feet from the left edge, the painting reveals the geographic position of the mural itself (At Pen Station, in Hillsdale California, with Mount Diablo in the background), as well as its relative position along the mission trail, which is between the San Jose and the Dolores missions, pictured on either side. 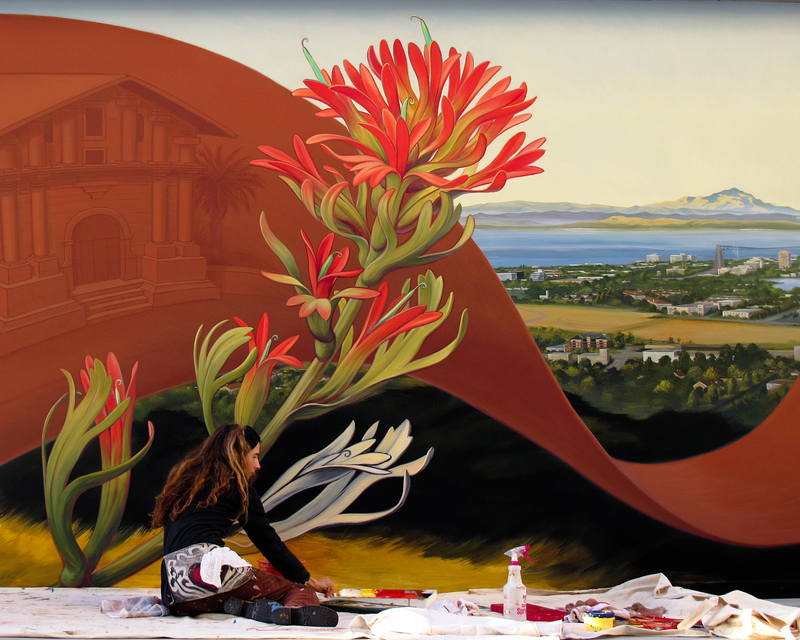 The full-colored contemporary landscape breaks from the red and gold duotone of the mural, representing contemporary California. A castilleja, a native red wildflower commonly known as “indian paintbrush”, bridges the past and the present. 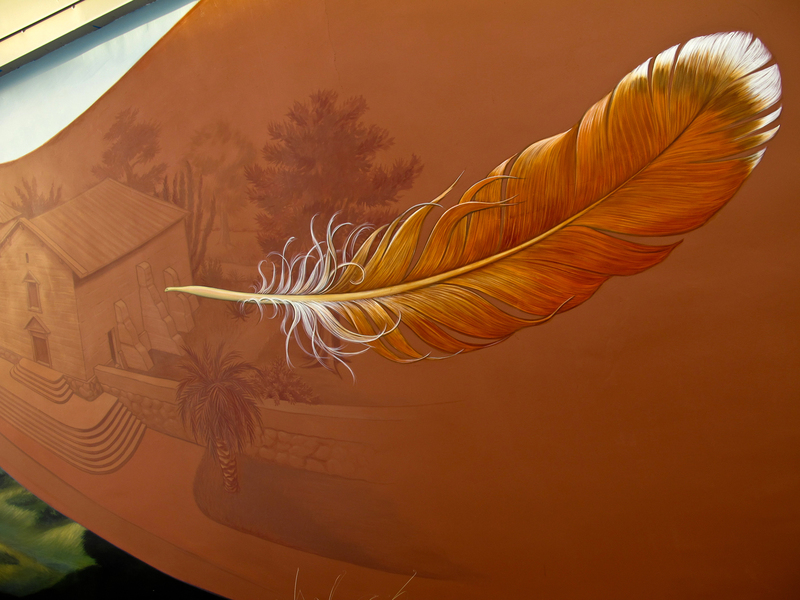 Further along, a falling red-tailed hawk feather floating over the San Jose mission is the mural's ending symbol of that El Camino Real history that didn't leave many physical landmarks to depict.